It feels as though magic is afoot in Cameron Gainer’s Luna del Mar (2012) or at least a heavy reliance on cinematic trickery such as careful lighting and extensive post-production. We see a single screen awash in blue and black, constantly in motion. 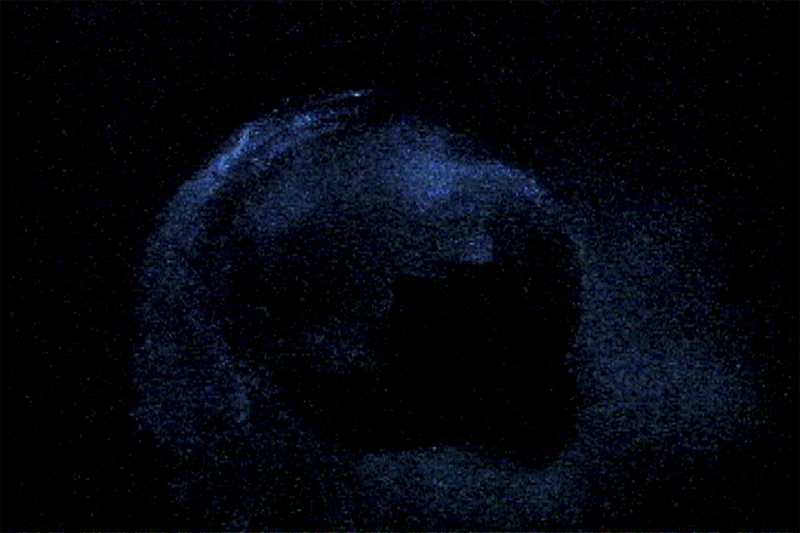 At one moment a figure twists, turns, and writhes in a body of water, but in a few frames any recognizable form is gone and the screen is given over to abstract movements of fluid blue. In actuality, Gainer shot the piece in a bioluminescent bay off the coast of Vieques in Puerto Rico, with the aid of a deep sea videographer and her collaborator, the Olympic synchronized swimmer Luna del Mar. Largely underdeveloped because of a continued U.S. Naval presence, Vieques is now controlled by the U.S. Fish and Wildlife Service, making it the largest national wildlife refuge in the Caribbean. It is also one of the best examples of bioluminescent waters in the world. Careful conservation efforts are in place to ensure it does not suffer the same fate as nearby La Parguera Bay, a once brightly bioluminescent body of water, where pollution from gasoline and oil and the waste of construction from development has destroyed sea grass beds, severely damaging the ecology so that the population of luminescent organisms has been cut in half. Cameron Gainer, “Luna del Mar,” 2012. Video with surround sound, TRT 18:52 minutes. Courtesy of the artist. The effect of del Mar’s undulating body as she swims through the water creating wakes of brilliant blue pulsing light patterns seems impossible to imagine as a natural process. But it is, made by the hundreds of thousands of bioluminescent single-cell organisms called dinoflagellates which are contained in each gallon of water. When the dinoflagellates are disturbed they emit a brief flash of blue light. The result: the human body may be made up of approximately 30 trillion cells, but we can still be left in awe by the capabilities of a body made up of only one cell. Gainer worked on this piece for four years. The soundtrack composed by composer Alex Waterman consists of such sounds as hulking metal, water smacking against something solid, the echo of a cello, and other unidentifiable sounds. The shot used for this piece was taken at 2 a.m. when the dinoflagellates, ruled by circadian rhythm, were at their maximum bioluminescence. The ritualistic, repetitive movements are at times very carnal and aggressive, at others slow and calming. At just over eighteen minutes, the film pays reverence to the spectacular power of our natural environment at a time when it is in need of our protection.